Neon along Ocean Drive in Miami Beach, Española Way and Clay Hotel, Mile Marker 0 in Key West. Arriving in Miami is like stepping into Latin America without ever leaving the States. Its location on the far southern tip of the U.S. mainland, dangling into the Caribbean region makes it a multicultural crossroads of the Western Hemisphere. Latin music, food and art is everywhere, and Spanish is heard more often than English in South Beach. Miami International Airport is one of North America’s major passenger hubs, so finding flights there is simple. From Miami Airport Station, we caught the #150 Miami Beach Airport Flyer bus. It makes a non-stop trip to Mid Beach by way of the Tuttle Causeway and then makes local stops on its southward route along Washington Avenue. It only costs $5 and less than an hour after stepping out of the airport, we were standing at the front door of our hotel. We spent two nights at the historic Clay Hotel at the corner of Washington Avenue and lively, pedestrian-only Española Way. The rooms are simple, but they have everything you really need and the location is perfect. We walked everywhere in town from the hotel. A nice breakfast is also included each morning. People looking for luxurious options will probably be happier at one of the countless resort hotels lining the beach, but we don’t travel to spend time in hotels, we prefer to get out and explore. Our first stop was the Wolfsonian museum a few blocks south. The Miami Beach art scene is better known for the popular Bass Museum of art, but we were in the mood for something a little less traditional. The Wolfsonian has a large collection of 20th century industrial design items, housewares, furniture and architectural artifacts as well as rotating exhibits. A collection of World War I posters and propaganda was on display during our April visit. 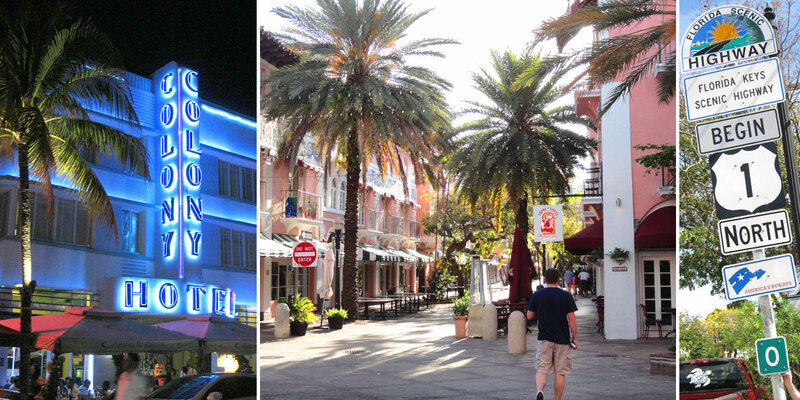 Our favorite aspect of Miami Beach was the architecture of the Art Deco District. Strolling in any direction around South Beach takes you past tons of well-kept examples of the style. During the day it’s all “Golden Girls” pastel colors, but nighttime is even better with buildings featuring vivid neon signs and accent lighting. 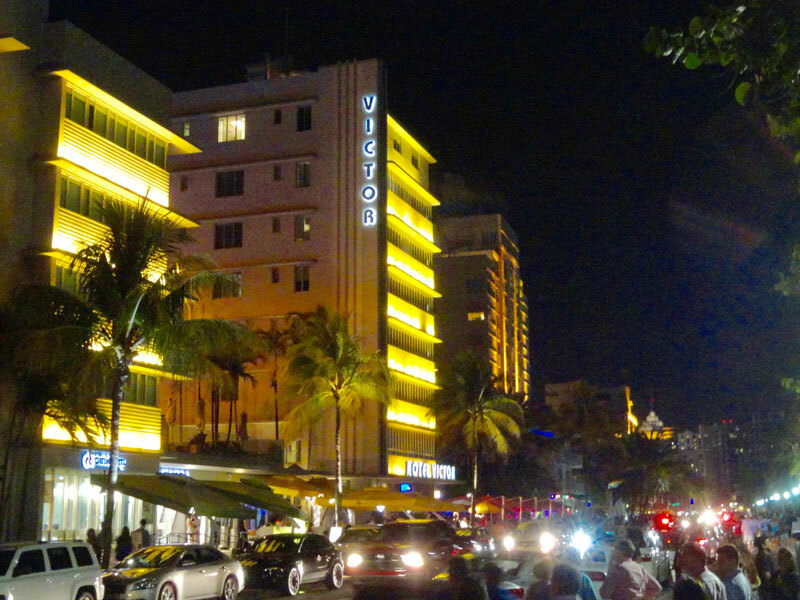 Night is also when Ocean Drive becomes loud and crowded with a perpetual traffic jam of really expensive cars. The people-watching potential is excellent. On the food front, Havana 1957 provided wonderful Cuban flavor right across the street from the Clay (they also have a location on the Lincoln Road Mall). The house specialty chicken is delicious, as were the complimentary plantain chips given to us at the bar while we waited for our table. The following night we had a great dinner at the much quieter Local House further south. One dining fact to remember when visiting Miami is that unlike the rest of the U.S., the tip is usually already included in the bill. Also, Miamians love their rum-based drinks, so prepare for lots of mojitos, daiquiris and general tropical sweetness. Former road/rail span at Bahia Honda State Park. The road trip portion of the vacation involved driving from Miami Beach all the way down Highway 1 to Key West. This portion of the road is known as the Overseas Highway because of the 42 bridges that link the islands of the archipelago. It was originally completed as the Overseas Railroad in 1912 but when large portions of it were destroyed during the 1935 Labor Day Hurricane, the rail route was cut off at Florida City and the state built a roadway over the surviving viaducts and trestles. The drive is fascinating, with island after island passing by and nothing but bright blue water beyond the railing for long stretches. 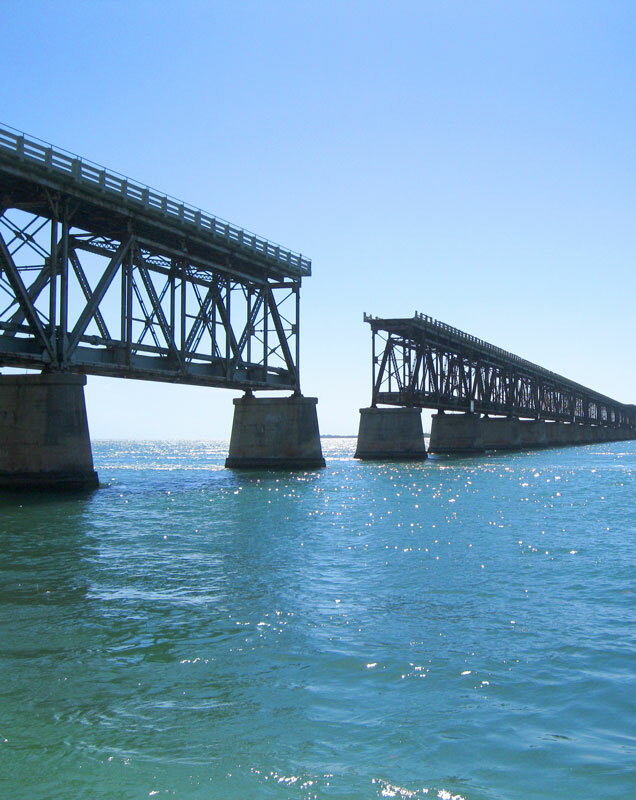 The longest of those is the accurately named Seven Mile Bridge, which connects Knights Key to Little Duck Key about 40 miles from Key West. It’s amazing to think that people originally envisioned and built this engineering work around the turn of the 20th Century. The whole route can be heavily trafficked and speed limits are fairly slow, so just relax and plan on it being a leisurely drive. On the road we checked our National Geographic Highways and Byways book for restaurant recommendations and ended up at Snappers in Key Largo. It turned out to be the perfect brunch spot with great eggs benedict, shrimp & grits and bloody caesars, all overlooking a small boat harbor. The next stop we made was at Bahia Honda State Park, just a couple keys beyond Seven Mile Bridge. The park features beaches, campsites and a section of the original Overseas Highway you can walk onto for a good viewpoint of the area. After that we took a detour onto Big Pine Key to see the National Key Deer Refuge. This species of deer is found only on a few islands and is strictly protected by law and low speed limits. They look similar to white tailed deer in miniature, only about 25-30 inches high at the shoulder. Just a few miles off Highway 1 on Key Deer Boulevard are the best places to view them, the Blue Hole and the Jack Watson and Fred Mannillo Trails. We hiked both short trails and came across one little guy foraging in the brush, but we also saw two preparing to cross the highway by the Winn-Dixie, so your odds of seeing them are about the same no matter where you are on Big Pine Key. NYAH hotel decks and pools. By late afternoon we rolled into Key West and were greeted by wild chickens crossing the road. We stayed three nights at NYAH (Not Your Average Hotel) and found the name to be fitting. It has affordable rates, flexible rooms and while it’s centrally located, it’s enough off the beaten path to be quiet. They also don’t allow children, which is a big plus if you ask us, but an annoyance to families seeking lodging. The hotel encompasses 5 former houses and the yard space in between has been transformed into a series of pools and patios. Multiple layers of sun decks and private balconies are stacked up overlooking the pools, very cool. We ended up in a room that could sleep up to six for just the two of us. Street parking is difficult because most spaces in the old town area are reserved for local residents, but we found a large garage just a couple blocks from our hotel (James and Grinnell) that has reasonable rates and easy access. We only needed to stash the rental car for one night because you can walk, bike or taxi everywhere. We returned the car to Alamo the next morning. 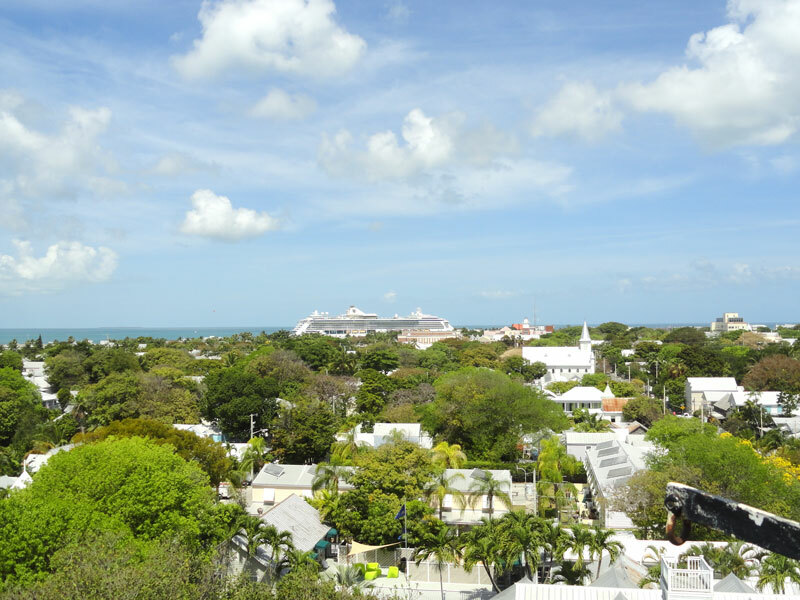 View of Key West from the top of the lighthouse. There are enough historic sites in Key West to spend an entire day exploring on foot. We got the lay of the land by following portions of the self-guided Pelican Path Walking Tour. Pick up a guide brochure at the Key West Chamber of Commerce office on Greene Street, or download one here. It’s a good way to get some history at your own pace. Most of the nightlife and touristy shops line Duvall Street. It’s lively, but most of our favorite things were off the main drag. One of our favorite finds was President Truman’s Little White House, which is where he lived and worked during his many visits to Key West. He originally arrived due to doctor’s orders for relaxation, but eventually began bringing his Cabinet members with him so he could continue running the country while away from Washington. The best part of the house is that almost every piece of furnishing is original. A highlight is the custom Navy-built poker table where the president and his cabinet would gather for nightly low-stakes card games. Several blocks south on Whitehead street is the home where Ernest Hemingway lived from 1931 through 1939 with his second wife Pauline. The $13 admission allows access to the house and grounds, visitors can walk through at their own pace or join one of the guided tours that begins periodically in the living room. 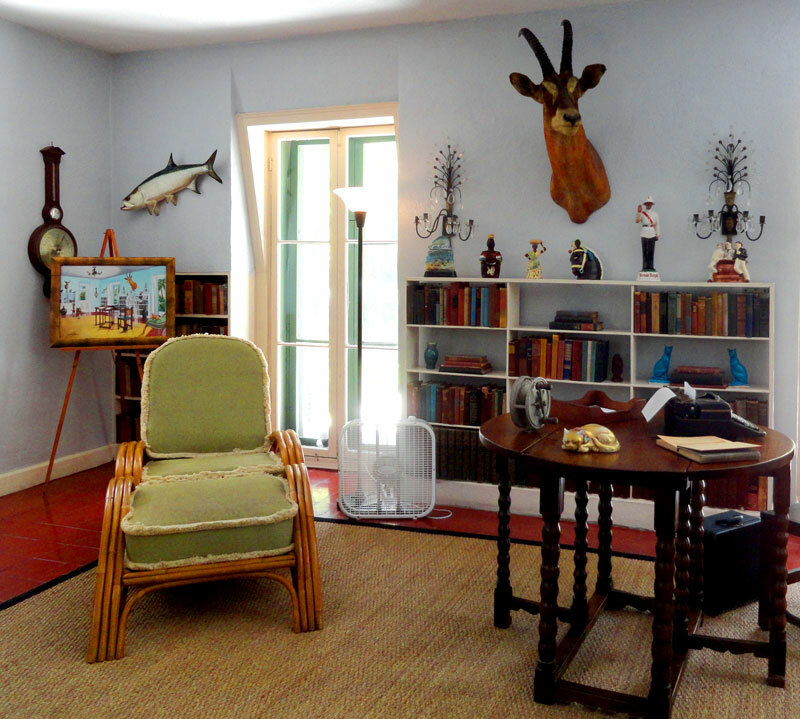 Hemingway’s furniture and art are on display as well as descendants of his famous six-toed cats. Don’t miss his study in the rear building, the spectacular backyard pool and the lawn that makes you feel like you’re in a botanic garden. Across the street from the Hemingway home is the Key West lighthouse, built in 1848 to mark the island for passing ships. A small museum in the old keeper’s house displays artifacts and tells the history of lighthouses around the Keys. Climb the 88 spiraling stairs to the top for a 360 degree view over the entire island. Further south where Whitehead Street runs into the ocean stands the buoy painted with “Southernmost Point”, which makes for a great vacation photo op. Another random thing to check out if you happen to be passing by is the 0 mile marker of U.S. Highway 1 where it begins its 2,369 mile journey up the east coast to the Canadian border at Fort Kent, Maine. Toward evening, hundreds of tourists gather on Mallory Square to watch the sun set. The sunset here is no different than any other sunset you’ve seen, but you can also take in some kitschy street performances featuring juggled flaming objects, ill-advised climbing of unstable structures and maybe a trained pig, perhaps all three at once. Don’t feel the need to linger too long, instead, use this time to find somewhere to eat and/or drink. Our concensus for favorite meal of the entire week was at Azur, located just a couple blocks from NYAH. The grilled octopus appetizer was amazing as were the entrees of seafood risotto and the special fish of the day. We also enjoyed a meal of inventive tapas at Santiago’s Bodega, a favorite recommended by locals. Fried risotto and scallops were our favorites there. On the drinking side of things, our pre-trip research pointed us to 2 Cents restaurant & bar. This gem tucked away on narrow Applerouth Lane west of Duvall was recommended as the best place in town to get an adult cocktail, (we returned the following evening for food as well). We ordered a couple cocktails off the menu and then left it up to dealer’s choice for the next. The great bartender made us a “proper pimm’s cup” and it was muddled deliciousness. He even provided a “key west koozie” (two plastic cups with a layer of insulating napkins in between) so we could take our second one on the road and not suffer chilled hands or a warm drink. FYI, It’s not technically legal to carry open containers by Key West law, but I think they generally look the other way if you’re behaving. Another fun cocktail experience was at the 8-seat Orchid Bar at the super retro Orchid Key Inn. Bartender Teri infuses her own spirits and can tell a great hurricane story. If you’re more in a beer mood, head to The Porch for a great tap and bottle selection and awesome porch seating to enjoy them. The only thing we forgot to indulge in during our stay was key lime pie. Damn, guess we have to go back. If you follow us you already know the main reason we visited southern Florida was for its three national parks, Everglades, Biscayne and Dry Tortugas. Read about that portion of the trip here. 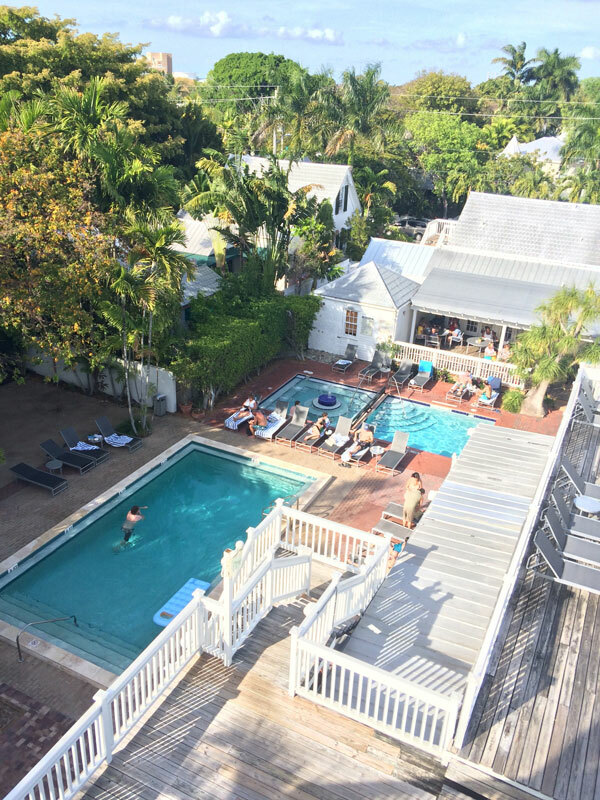 This entry was posted in Destinations, Travel Resources and tagged Clay Hotel Miami Beach, Key Deer Refuge, Key West Restaurants, Key West Road Trip, Miami, NYAH Key West, Overseas Highway Road Trip, Southernmost Point. Bookmark the permalink.